Views don’t get much better than the sight of Abu Dhabi, Al Reem Island and the Marina from Regus Tamouh Tower. On the 16th floor of this gleaming, modern skyscraper, you’ll find a wide choice of facilities, whether you need a private office, meeting room, training room, shared office or a total business package. The Tamouh Tower is situated in the famous City of Lights development, which means many high-profile businesses are close by, as well as entertainment and leisure facilities, including premium restaurants and hotels, and high-quality shops. The heart of Abu Dhabi city is easily accessible via the nearby connecting bridges. Located in Lugano’s thriving central business district, Regus Quartiere Maghetti offers you the perfect base in a town well known as both a conference destination and a research and technology centre. Whether you need a full-time office or a meeting room for an hour, these workspaces have all you need to be productive. The building is close to shops, bus stops and public parking, while Milan’s Malpensa Airport is just an hour away. Apart from its serene views across the nearby Alpine lake, Lugano has much to offer when downtime beckons, including a new cultural centre known as LAC (Lugano Arte e Cultura), Renaissance churches, Belle Époque hotels and the inspirational green space of Parco Ciani. From its natural stone, ground-floor façade to all nine glazed floors above it, Regus Loreto makes a big impression. So, no wonder it’s home to major companies such as Wella and Procter & Gamble. The Regus rental offices are on the second floor of the building, which is conveniently located in the Central Station area of Milan, close to the Loreto M1 M2 bus station and the Centrale FS subway station. The flexible workspace offers different options as your day changes, meaning you can move from private offices to co-working spaces or meeting rooms and conference rooms. And if you want to treat clients (or yourself), there are plenty of restaurants and bars in the vicinity. For something more cultural, the Stephen Woods Foundation exhibits 300 20th-century Italian works of art in a former private home. With its impressive five-storey glass façade, the home of Regus Almedà Park Cornella is entirely appropriate to its hi-tech surroundings. Located in the thriving WTC Almedà Business Park in Cornellà de Llobregat, 15 minutes from the centre of Barcelona and its airport, the third-floor offices offer a flexible, light-filled workspace with a mixture of contemporary private offices and co-working spaces, as well as meeting and conference rooms. Almedà train and metro stations are close by. The business park itself boasts several restaurants, a bank, a courier service and a large central garden where events are held on a regular basis. A little further afield can be found the Splau shopping centre and the RCDE stadium, home to local football team Espanyol. 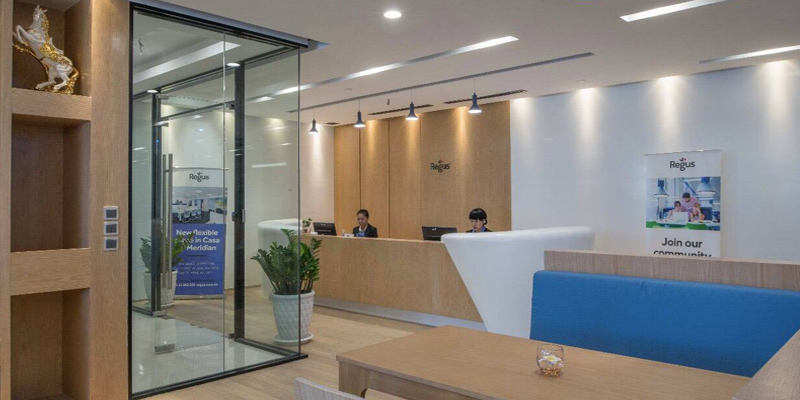 It’s hard to miss Regus Exchange Square (pictured above), which is located in a striking office block in the heart of the Cambodian capital’s central business district. Once inside, you’ll discover uninterrupted views across the city and the Mekong River, and find all your business needs are taken care of, whether you need open-plan co-working spaces, comfortable private offices, conference facilities or meeting rooms. Rith Mony bus station and Phnom Penh railway station are both less than a ten-minute walk away, so commuting to and from the office, and exploring the city, couldn’t be easier. A wide range of restaurants are nearby, and a stunning example of Cambodian culture is just around the corner in the shape of the Wat Pho temple complex. Hosted in a handsome, turn-of-the-century building in the centre of Vienna, Regus Kohlmarkt places you at the heart of the Austrian capital, which was recently ranked the world’s most liveable city. This collaborative co-working business centre provides rental offices, hot desks and shared working spaces, all featuring 24-hour access, high-speed Wi-Fi and Regus cloud storage. The location has fantastic links to local transport, including Herrengasse subway station, Michaelerplatz bus station and the Rathausplatz/Burgtheater ring metro stop. The many attractions of Vienna’s historic city centre include the Museum der Illusionen and Hofburg Palace, both within easy walking distance. And, of course, you’re never too far from a schnitzel or a strudel. For a room with a view in Slovakia’s booming modern capital city, it’s hard to beat Regus Polus Towers, which is located in one of the two towers that rise above the expansive Polus City Center shopping mall. The business centre offers offices, hot desks and meeting rooms, while the nearby Polus City Center bus station connects you to the Bratislava Nové Mesto train station, which is just a ten-minute journey from the airport. The super-modern shopping centre gives you access to a hypermarket, a cinema complex and more than 120 shops and restaurants. If you’re looking for somewhere to unwind during a lunch break, try the nearby Museum of Transport or the Centrum vedy CVTI SR Science Museum. 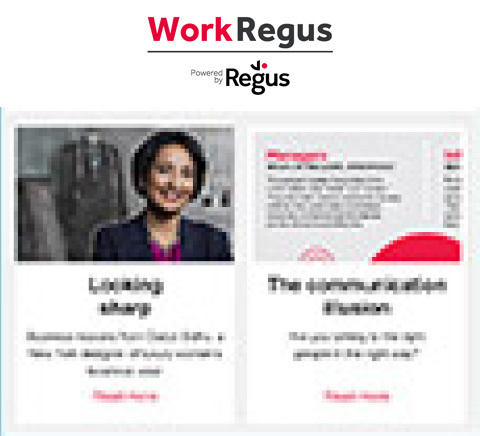 If you want to be a part of London’s booming business scene while removed from its hustle and bustle, Regus Innova Park fits the bill perfectly. Your team can enjoy fully serviced office spaces, meeting rooms and conference facilities, while there are also co-working areas and hot-desking facilities for entrepreneurs and small startups. London is within easy reach – just an 11-minute walk takes you to Enfield Lock railway station, followed by a 25-minute ride to London Liverpool Street. Regus Innova Park is also easily accessible by road from the M25 and has ample parking space. And there’s plenty to occupy your downtime in the surrounding area, including local heritage on show at Enfield Museum and local brews at the nearby pubs. The centre of Warsaw is home not only to its most important national and municipal institutions but also to most of its famous tourist attractions, and that’s where you’ll find Regus Polna Corner. A modern and well-connected co-working space for businesses of all sizes, it offers 24-hour access to its offices and conference rooms. On-site facilities include secure underground parking with bicycle storage and CCTV monitoring, an internal coffee bar with lunch restaurant and sandwich service, and business-quality Wi-Fi throughout the building. The nearest metro station and bus stop are both just 100 metres away, allowing easy access to the Polish capital’s many cultural attractions. Located in a striking triangular building in the ancient fortress city of Den Bosch, Regus Pettelaarpark offers a full range of private office rooms, co-working space, meeting rooms, conference facilities or somewhere to hotdesk. The facilities include fast Wi-Fi, plenty of car-parking space (the main highway is just a short hop away), and an onsite restaurant. The city centre can be reached quickly via a 13-minute bus ride. Head there after work for a canal boat ride, to visit a jazz café, or just to enjoy the quaint little restaurants and bars that line the medieval streets. Alternatively, take a short walk to De Pettelaarse Schans – a beautiful, star-shaped former fort lined by trees.